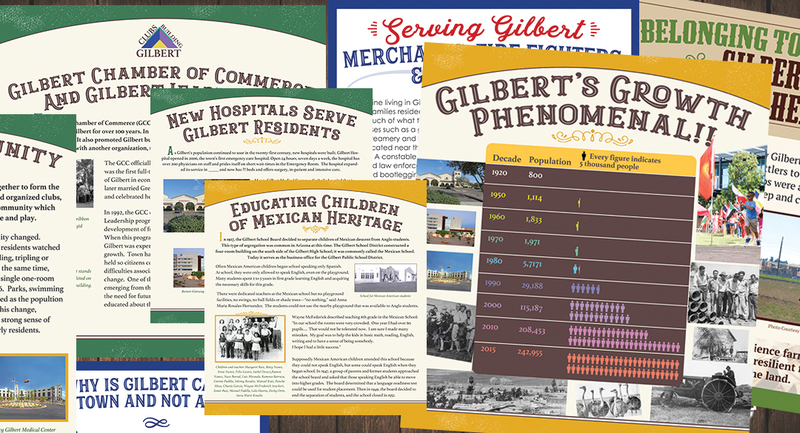 Part of the recent re-branding of the Gilbert Historical Museum in Gilbert AZ, Christina Rosepapa designed and produced over 70 interpretive signs. These signs replaced outdated displays in 3 large museum rooms. Working with a team including a Museum Curator and Director, Chris designed the signs to be informative, easy to read, specific to a theme for each room and eye catching. The fast paced project was under a tight deadline and had several elements that had to be in place. From topics that ranged from Gilbert’s farming heritage to current topics such as “What led to Gilbert’s rapid growth”, The story of Gilbert throughout generations of community and business is represented in a fresh and informative way. Hundreds of images needed to be manually processed and large scale graphics accurately designed, this needed to compliment text areas with consistently, ease and flow.